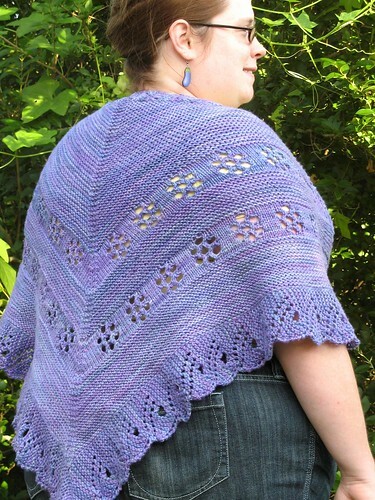 Introducing my latest pattern: Marilla’s Very Practical Shawl! 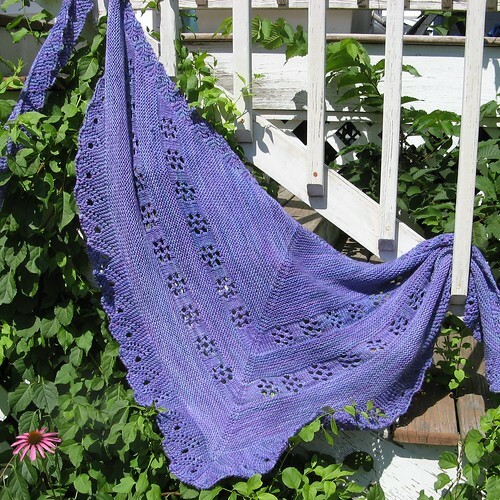 This Danish-style tie shawl is worked from the bottom up in worsted-weight yarn. Inspiration: I read the Anne of Green Gables series several times over while I was growing up (and at least once as an adult). It’s easy to like Anne—we’re meant to like her–but I always had a soft spot for Marilla Cuthbert. Prickly, practical, and tough, she protected a tender heart with a convincing façade. 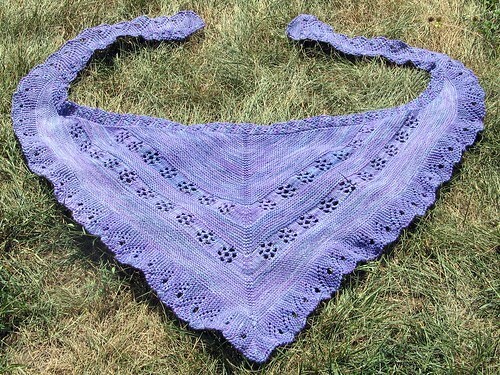 I like to think Marilla would have liked this shawl. It’s warm, knits up quickly, and the long Danish-style ties allow you to wrap and secure the shawl around your shoulders and waist. But, there’s just enough lace to make it pretty, too. 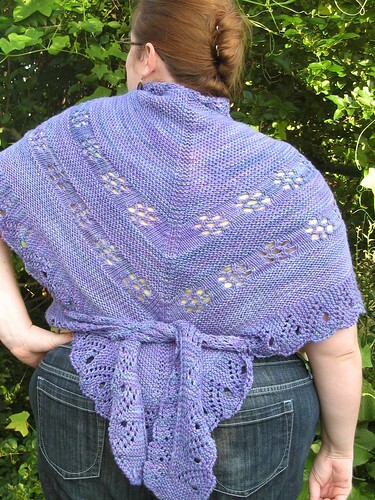 I made a shawl in this style a couple years ago, and I wore it all the time last winter. I loved how the ties held it in place, and allowed several different ways to wear it. For cool days, I wore the shawl over my shoulders with the ties going directly under my arms and tied behind — like a shrug. On frigid days, I crossed the shawl over my chest, wrapping the ties around myself before tying them behind. Both ways allowed great freedom of movement while staying warm, and pretty too! I even wore this shawl to dog agility events. My interpretation of this type of shawl is larger overall, with longer ties. I used worsted-weight yarn to make it warmer and faster to knit. I tried to streamline the construction to eliminate as many loose ends as possible. Design/Skills Needed: The shawl begins with the bottom edging, worked from right tip to left tip, with a short-row corner halfway through. Stitches are picked up along this bottom edge, leaving 8 repeats at both tips to form the ties. The body is worked from the bottom edge, with decreases to form the spine and top edge. After the body is completed, the neck edging is worked from right tip to left tip and joined to the body as you go. It’s worth noting that the bottom edging uses about 40% of the yarn … so even though it takes a long time, you are nearly halfway done when you finish it! The pattern includes some charts; however, all charts are also completely written-out, for knitters who prefer to work from written directions. 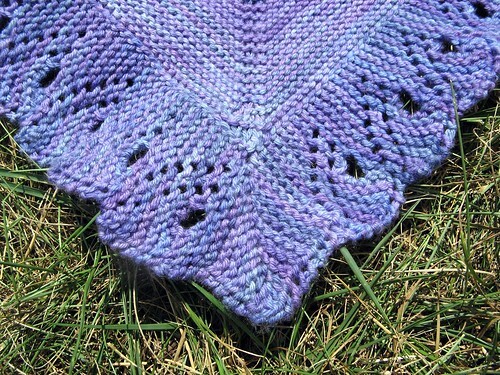 Yarn: Almost any worsted-weight yarn will work with this pattern. I love it! You are so talented. Some day I’d really like to take up knitting. Thank you! I know you’d be great at knitting — you have such an eye for color, with all that quilting!